For some time, scientists have been fascinated by the concept of metallic hydrogen. Such an element is believed to exist naturally when hydrogen is placed under extreme pressures (like in the interior of gas giants like Jupiter). But as a synthetic material, it would have endless applications, since it is believed to have superconducting properties at room temperature and the ability to retain its solidity once it has been brought back to normal pressure. For this reason, condensed matter physicists have been attempting to create metallic hydrogen for decades. And according to a recent study published in Science Magazine, a pair of physicists from the Lyman Laboratory of Physics at Harvard University claim to have done this very thing. If true, this accomplishment could usher in a new age of super materials and high-pressure physics. The existence of metallic hydrogen was first predicted in 1935 Princeton physicists Eugene Wigner and Hillard Bell Huntington. For years, Isaac Silvera (the Thomas D. Cabot Professor at Harvard University) and Ranga Dias, a postdoctorate fellow, have sought to create it. They claim to have succeeded, using a process which they described in their recently-published study, “Observation of the Wigner-Huntington transition to metallic hydrogen“. In the past, scientists have succeeded in creating liquid hydrogen at high temperature conditions by ramping up the pressures it was exposed to (as opposed to cryogenically cooling it). But metallic hydrogen has continued to elude experimental scientists, despite repeated (and unproven) claims in the past to have achieved synthesis. The reason for this is because such experiments are extremely temperamental. For instance, the diamond anvil method (which Silvera and Dias used a variation of) consists of holding a sample of hydrogen in place with a thin metal gasket, then compressing it between two diamond-tipped vices. This puts the sample under extreme pressure, and a laser sensor is used to monitor for any changes. In the past, this has proved problematic since the pressure can cause the hydrogen to fill imperfections in the diamonds and crack them. While protective coatings can ensure the diamonds don’t crack, the additional materials makes it harder to get accurate readings from laser measurements. What’s more, scientists attempting to experiment with hydrogen have found that pressures of ~400 gigapascals (GPa) or more need to be involved – which turns the hydrogen samples black, thus preventing the laser light from being able to penetrate it. For the sake of their experiment, Professors Ranga Dias and Isaac Silvera took a different approach. For starters, they used two small pieces of polished synthetic diamond rather than natural ones. They then used a reactive ion etching process to shave their surfaces, then coated them with a thin layer of alumina to prevent hydrogen from diffusing into the crystal structure. They also simplified the experiment by removing the need for high-intensity laser monitoring, relying on Raman spectroscopy instead. When they reached a pressure of 495 GPa (greater than that at the center of the Earth), their sample reportedly became metallic and changed from black to shiny red. This was revealed by measuring the spectrum of the sample, which showed that it had become highly reflective (which is expected for a sample of metal). In short, metallic hydrogen could speed the revolution in electronics already underway, thanks to the discovery of materials like graphene. Since metallic hydrogen is also believed to be a superconductor at room temperature, its synthetic production would have immense implications for high-energy research and physics – such as that being conducted by CERN. Beyond that, it would also enable research into the interior’s of gas giants. 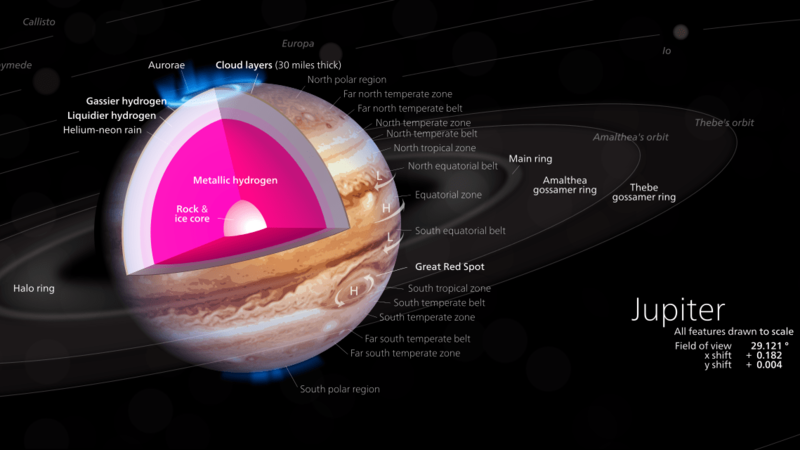 For some time, scientists have suspected that a layer of metallic hydrogen may surround the cores of gas giants like Jupiter and Saturn. Naturally, the temperature and pressure conditions in the interiors of these planets make direct study impossible. But by being able to produce metallic hydrogen synthetically, scientists could conduct experiment to see how it behaves. Naturally, the news of this experiment and its results is being met with skepticism. For instance, critics wonder if the pressure reading of 495 GPa was in fact accurate, since Silvera and Dias only obtained that as a final measurement and were forced to rely on estimates prior to that. Second, there are those who question if the reddish speck that resulted is in fact hydrogen, and some material that came from the gasket or diamond coating during the process. However, Silvera and Dias are confident in their results and believe they can be replicated (which would go far to silence doubts about their results). For one, they emphasize that a comparative measurement of the reflective properties of the hydrogen dot and the surrounding gasket suggest that the hydrogen is pure. They also claim their pressure measurements were properly calibrated and verified. In the future, they intend to obtain additional spectrographic readings from the sample to confirm that it is in fact metallic. Once that is done, they plan to test the sample to see if it is truly metastable, which will consist of them opening the vise and seeing if it remains in a solid state. Given the implications of success, there are many who would like to see their experiment borne out! “According to Karl Nowak’s 1954 German patent, patent number 905847, Class 12g, Group 101, by a process of extreme cooling coupled with pressure, the basic atomic structure of material can be changed. It is reduced, narrowed and confined in terms of atomic, crystalline structure. . . . Admittedly, at first the idea of compression cooling as a means to change atomic structure sounds a lot like junk science. At this point Dr. Gordon Freeman weighs in with some remarkable scientific insight. According to Dr. Freeman, an elements [sic] behavior is determined by its arrangement of electrons orbiting the nucleus of that elemental atom. Seven electron shells are present around the core. Under high pressure electrons are shifted to lower orbits and new orbital overlappings are formed. This changes the whole behavior of the element concerning color, boiling temperature, density, and so forth. Gordon Freeman? I’m surprised he put down the crowbar long enough to get any actual science done. Certainly, the media picks it up like this. If true, this would indeed be a tremendous breakthrough. HOWEVER, extraordinary claims require extraordinary evidence. And this study falls surprisingly short of that. There is a large number of people who are astonished that this paper was accepted. For instance, the authors published without reproducing their results. They should have done that! As long as this hasn’t happen, one should take this with an extreme grain of salt! What this is not is not logical is not natural? How can a simplest chemical element, such as hydrogen, to become metallic element and retain the properties of hydrogen. This would be the same as if made from the amoeba to an elephant and the elephant behaved like an amoeba. It is strange that scholars to this day do not know of which is formed by a hydrogen atom. It is known that hydrogen is formed by protons and electrons orbiting a proton. But most importantly, do you know of what and how they are formed: electron, positron and proton rest, if he be stripped of Positron. It may be that hydrogen under high pressure to change its structure, or hydrogen becomes metallic, it’s fiction. Proton contains: 3kg and positron particle (3 quarks and gluons 3). When you compress the hydrogen atom, where electrons escape? And what happens to the particle 3kg. Science does not know because it does not know what it is and how 3kg particles occurs. If the electron flies into a proton, will get yet another gluon and the quarks will be subjected to even stronger magnetizm who can “burn” or merger of electrons and positrons (gluon) releases a lot of energy that would lead to an “explosion” quark-gluon plasma and when pressure disappears, nothing from this experiment. In vain attempts to overcome nature.